Mutual Funds Folios Increased! Are Investors Turning Wiser? Elections are around the corner, and the government is busy presenting its report card to voters. The opposition is busy too, pinpointing at the possible shortcomings of the government. Sensible voters usually don't get carried away by political campaigns as they know who the best choice is for them and for the nation. Hopefully, the count of such voters will grow substantially this time. Electing the right candidate and selecting the right mutual fund are equally difficult and important. As far as mutual fund investors are concerned, they have definitely become more mature in the last 4-5 years. But they have more to learn. The industry has evolved into a more sophisticated industry, but it has more to learn too. 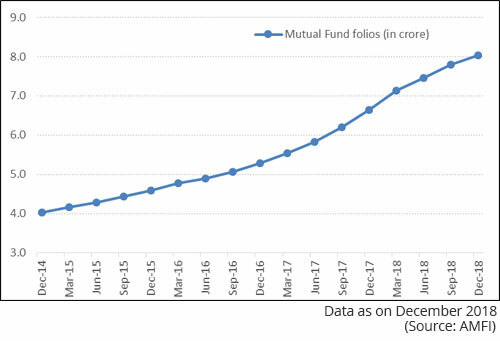 Over the last four years, the count of mutual fund accounts or folios nearly doubled from 4.03 crore in December 2014 to 8.03 crore in December 2018. In January 2019, the total number of accounts rose further to 8.1 crore, thereby recording a rise in for the consecutive 56th month. Graph: Investors exuding confidence. Will the trend sustain? 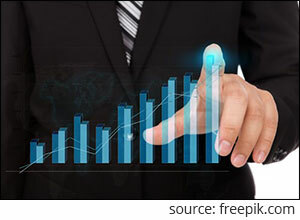 While long-term trends suggest that investors are exuding confidence, taking the risk, and deploying their hard-earned money in mutual funds in pursuit of better returns, amidst a time where the real rate of return clocked by traditional instruments such as bank fixed deposits do not seem very effective from a financial planning point of view, most investors also seem about going wrong with their scheme selection. As compared to Rs 8,022 crore in December 2018, the industry collected Rs 8,064 in January 2019 via SIPs (Systematic Investment Plans). There's been a healthy 21% growth in SIP collections on Y-o-Y basis. With this, the mutual fund industry has approximately 2.57 crore SIP accounts now. AMFI data further suggests that the industry has so far added around 9.31 lakh new SIP accounts every month on an average in FY 2018-19. Looking at the aforesaid data, it's clear that investors are increasingly aware and are sticking to their SIPs even when the mutual fund schemes aren't making much return currently. While the persistence of new SIP registrations is a good sight amidst dwindling new inflows in equity mutual funds, it remains to be seen how long the retail investors would maintain this trend. Amidst the volatile market conditions, the addition of new accounts has slowed. Over the last three months, i.e. November 2018 to January 2019; the net addition to the tally of SIP accounts has just been 5 lakh -- just 54% of average additions for FY 2018-19 so far. Despite some jitters experienced in the recent past, liquid funds continue to remain the investors' favourite. It looks like, debt-oriented funds and gilt funds do not appeal to retail investors. Investors seem cognisant about the interest rate cycle, and the recent fiascos of IL&FS and DHFL. Equity-oriented funds and aggressive hybrid funds continue to grow but the pace of growth, currently, is waning. On the other hand, Exchange Traded Funds (ETFs) investing in assets other than gold such as equity ETFs is growing at a healthy rate. Investors continue to shun gold ETFs, which in our view is a mistake. Amidst a time when there is global uncertainty, geopolitical tensions, trade wars, and its impact on economic growth; it would be would prudent to allocate 5-10% to gold for its trait of being safe haven, a store of value. Between December 2014 and December 2018, equity mutual funds and aggressive hybrid funds put together have recorded a three-fold jump in Assets Under Management (AUM) and two-fold jump in the number of folios. But, ETFs (other than gold) have registered a sixteen-fold rise in AUM and four-fold rise in the number of accounts. What's so worrying about this trend if investors are choosing a simple ETF route over a tedious process of identifying outperforming mutual fund schemes? Many investors might be switching from active investing to passive investing merely because of poor advice they received from mutual fund distributors. But if you wish to clock alpha, i.e. clock return over and above the benchmark index, actively managed funds should be your choice. You should invest in actively managed mutual fund schemes that can consistently beat markets and their peers. And prefer mutual fund houses that follow robust investment processes & systems and pass on cost-savings to their investors through lower expense ratios. Before you invest in mutual funds, you should consider your investment objectives, financial goals, time horizon, and risk appetite to ensure you don't invest in products that are detrimental for your financial well-being. Always follow your personalised asset allocation plan while investing in mutual funds. Do not invest in mutual funds based on your friend's and relative's advice. One man's meat could be the other man's poison. Assess available scheme options on various qualitative and qualitative parameters. Seek expert advice if you think you don't have time or expertise to select the top-performing mutual funds for yourself. A sensible approach with an astute strategy in place will determine your success in investing. PS: If you're unsure where to invest fresh investible surplus currently and are looking for "high investment gains at relatively moderate risk", PersonalFN's Premium Report, "The Strategic Funds Portfolio For 2025 (2019 Edition) would be suitable for you. In this premium report, you will get a ready-made portfolio of top equity mutual funds schemes for 2025 based on a core and satellite approach to investing. These schemes have the ability to generate lucrative returns over the long term. PersonalFN's "The Strategic Funds Portfolio for 2025" is geared to potentially multiply your wealth in the years to come. Subscribe now! Equitymaster requests your view! Post a comment on "Mutual Funds Folios Increased! Are Investors Turning Wiser?". Click here! As compared to net inflows of Rs 3,948 crore in the equity category during February 2019, the inflows for March 2019 were strong at Rs 9,014 crore. If you engage in Tax planning from the beginning of the year you will not do ad hoc investments.